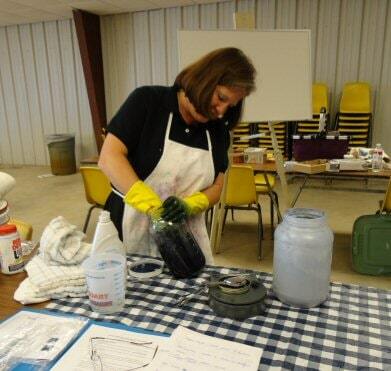 I was happy to be able to attend the Fiber Christmas in July event between Kellyville and Sapulpa, Oklahoma last weekend – and delighted to take a class on dyeing with indigo! That class was my motivation for making the trip down, but of course, it was fun to make the rounds of the vendor booths. I was marvelously restrained in my purchasing, but it definitely taxed my self-control several times. 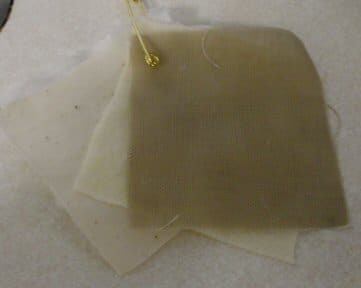 I bought some lovely dark brown Shetland fleece, spinning wheel oil, and after the class, powdered indigo and the chemicals I will need to do my own dyeing. 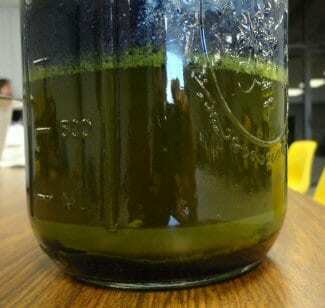 But on to the show… the first part of the process involves mixing the powdered indigo plant into a paste. Here’s instructor Gina Levesque, really getting into it. And yes, you can tell from her gloves and apron that she’s done this a time or two before! Gina is a very interesting person, and I would have enjoyed more time to visit with her. Maybe one of these days, we’ll cross paths again. In the meantime, there’s always her Etsy store! 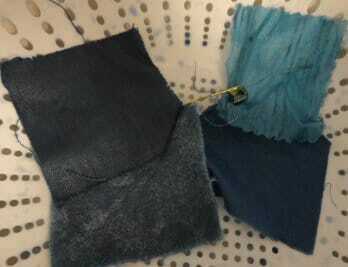 Indigo is not water soluble, but requires a chemical reaction, or reduction, necessary to produce an indigo dye vat. One effective method from pre-industrial times used stale urine. Instead of historical accuracy, we opted for chemicals. At this point, the indigo mixture is ready to go into the pot. 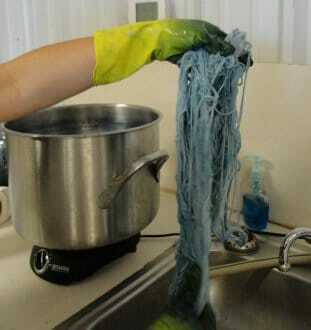 The dyer must pay attention to the amount of oxygen in the pot, indicated by the color of the dye bath. 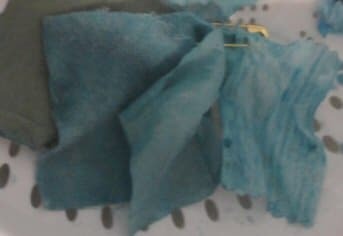 With indigo, instead of leaving the fiber in the pot longer to achieve deeper shades of color as with most dyes, the yarn or fabric must be dipped and lifted out repeatedly, building up the blue each time it hits the air and oxidizes. The sample skein, after its first dip. Sigh. Aren’t they beautiful? Now I’ll just need to decide what I’m going to dye for myself! In the meantime, I can mull over the fascinating history of this dye, from ancient times until now. That’s one of many things that draw me to fiber work – what I have in my own hands connects me to a world of people who came before me, and their stories.